Taiwan is also commonly used to refer to the territories administered by the Republic of China (ROC). It is recognized worldwide as a competitive nation and it has ranked consistently near the top in surveys regarding economic performance and technological development around the globe. One of East Asia’s most dynamic, successful, and beautiful countries, Taiwan has enjoyed meteoric economic growth in the past five decades and today boasts the fourth largest economy in the region. With its unique blend of prosperity and modernity alongside strong traditional values and culture, Taiwan offers exciting opportunities. In 1895, military defeat forced China to cede Taiwan to Japan. Taiwan reverted to Chinese control after World War II. Following the Communist victory on the mainland in 1949, 2 million Nationalists fled to Taiwan and established a government using the 1946 constitution drawn up for all of China. Over the next five decades, the ruling authorities gradually democratized and incorporated the local population within the governing structure. In 2000, Taiwan underwent its first peaceful transfer of power from the Nationalist to the Democratic Progressive Party. Throughout this period, the island prospered and became one of East Asia’s economic “Tigers.” The dominant political issues continue to be the relationship between Taiwan and China – specifically the question of eventual unification – as well as domestic political and economic reform. Taiwan has a dynamic capitalist economy with gradually decreasing guidance of investment and foreign trade by government authorities. In keeping with this trend, some large, government-owned banks and industrial firms are being privatized. Exports have provided the primary impetus for industrialization. The island runs a trade surplus, and foreign reserves are the world’s third largest. Despite restrictions on cross-strait links, China has overtaken the US to become Taiwan’s largest export market and, in 2006, its second-largest source of imports after Japan. China is also the island’s number one destination for foreign direct investment. Strong trade performance in 2006 pushed Taiwan’s GDP growth rate above 4%, and unemployment is below 4%. The island of Taiwan lies some 120 kilometers off the southeastern coast of mainland China, across the Taiwan Strait. The East China Sea lies to the north, the Philippine Sea to the east, the Luzon Strait directly to the south and the South China Sea to the southwest. The island is characterized by the contrast between the eastern two-thirds, consisting mostly of rugged mountains running in five ranges from the northern to the southern tip of the island, and the flat to gently rolling plains in the west that are also home to most of Taiwan’s population. Taiwan’s climate is marine tropical. The Northern part of the island has a rainy season that lasts from January to late March during the southwest monsoon. The entire island succumbs to hot humid weather from June until September, while October to December are arguably the most pleasant times of year. Natural hazards such as typhoons and earthquakes are common in the region. The cultures of Taiwan are a hybrid blend of Confucianist Han Chinese cultures, Japanese, European, American, global, local and indigenous influences which are both interlocked and divided between perceptions of tradition and modernity. After the retreat to Taiwan, the Nationalists promoted an official interpretation of traditional Chinese culture over the local Taiwanese cultures. The government launched a program promoting Chinese calligraphy, traditional Chinese painting, folk art, and Chinese opera. Since the Taiwan localization movement of the 1990s, Taiwan’s cultural identity has been allowed greater expression. Identity politics, along with the over one hundred years of political separation from mainland China has led to distinct traditions in many areas, including cuisine, opera, and music. One of Taiwan’s greatest attractions is the National Palace Museum, which houses more than 650,000 pieces of Chinese bronze, jade, calligraphy, painting and porcelain. 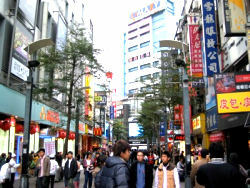 Taiwanese culture has also influenced other cultures. Taiwan film maker Ang Lee has directed critically acclaimed films. Taiwan’s education system produces pupils with some of the highest test scores in the world, especially in math and science. It has also been criticized for placing excessive pressure on students and eschewing creativity in favor of rote memorization. Although current law mandates only nine years of schooling, 95% of students go on to high school, trade school or college. The literacy rate in 2003 was 96.1%. Access to high school and university is controlled by a series of national exams. Discipline in public schools of all levels is generally very tight with school uniforms and morning reveille being the norm. Students of all levels through high school are responsible for cleaning their own classrooms and areas around the school, cleanup time being a daily ritual. The school year consists of two semesters. The fall semester begins in early September and runs till late January or early February. Winter vacation typically runs from two to three weeks around the Lunar New Year. Spring semester begins following the Lantern Festival in mid February and ends in early June. From middle school on, many schools hold “optional supplementary classes” during winter and summer vacation as well as after normal school hours. Despite the name, in many cases participation is compulsory. The language of instruction is Mandarin. Elementary schools span grades 1 through 6, classes are held from Monday through Friday, typically from 7:30 AM through 4PM (or noon on Wednesdays). Junior high school spans grades 7 through 9 and is the last half of compulsory education. Unlike the slower pace of elementary school, junior high students typically have a single goal in life: to score high on the national senior high school entrance exams at the end of 9th grade. Consequently, the pressure on students from teachers and parents is intense. Though instruction officially ends around 4PM, students often stay in school till as late as 8 or 9PM for “extra classes” (which typically consist of extra quizzes and review). Senior high school spans grades 10 through 12, again the main goal of students is to score highly on the national university entrance exams at the end of their third year. The pace is just as, if not more intense than junior high school. Discipline in educational institutions from high school and up (including vocational schools) are the responsibility of military officers stationed at the individual schools (as opposed to elementary and junior high school where teachers and school administrators were responsible for discipline). In addition to the normal subjects, students are also required to attend a military education class covering issues such as civil defense, military drills, national defense, and basic firearms training. In the past, high (and vocational) school students were expected to take on civil defense duties in the event of national emergency. Entrance to university is administered via two methods: Recommendations or Examination. For those that participate in recommendations, they have to take a national academic exam and selecting a list of majors that they are applying to. The first stage is a screening of exam results for eligibility, the second stage would be dependent on the conditions of individual departments selected. For those that did not choose to take the recommendations process, or failed their applications, they have the choice to participate in the national university entrance exams after graduation in hopes of university admission. Vocational schools are three-year institutions similar to normal high schools. Unlike normal high schools, they place a heavier emphasis on practical and vocational skills. Incoming students typically choose a single concentration, such as electrical engineering, civil engineering, computer science or business. Some specialized vocational schools also offer programs in seamanship and agriculture. Vocational school graduates may also participate in the national university entrance exams. It is not uncommon for students to select vocational school over high school and proceed to a four year college afterwards. There are over 100 institutions of higher education in Taiwan. Since the 1990s many trade schools and junior colleges have been “promoted” to university status. Taiwan has several universities, both public and private. Traditionally, public schools are viewed as being more prestigious than private schools. Engineering is extremely popular and engineering degrees account for over a quarter of the bachelor degrees awarded in Taiwan. Popular majors include: electrical engineering and medicine (traditionally the most selective, and most prestigious). In contrast with junior high and high school, where students are pressured by the highly selective entrance exams, college life in Taiwan is generally seen as being rather relaxed. Medical school in Taiwan begins as an undergraduate major and lasts seven years (six years for dentistry), with the final year being hands on training at a teaching hospital. Graduates of medical school may elect to continue on to graduate school to pursue a doctoral degree. Like medicine, law school is selected as an undergraduate major and lasts five years. Most higher educational institutions offering programs in education run five years, with students receiving teaching credentials at the end of the program. Students consenting to teach for a set number of years after graduating receive tuition waivers from the government. Prospective teachers typically go to a teaching junior college if they want to teach primary school, and teaching college for secondary school. Students enter five-year junior colleges after graduating junior high school and passing a national exam. The curriculum is similar to that of vocational schools with the exception that 5 year junior colleges run for two additional years. Students graduate with the equivalent of an associate degree and are ready to enter the workforce. Some students may choose to continue their studies at a two year technical institute or apply to transfer into a four year university. Two-year junior colleges offer advanced vocational training for graduates of vocational or senior high schools. Students graduate with an associates degree and may continue on to a 2 year technical institute, transfer to a four year university, or enter the workforce. Two year technical institutes offer vocational training for graduates of 2 year technical colleges. 4 year technical institutes typically accept senior high and vocational school graduates, and offer in depth job and vocational training.